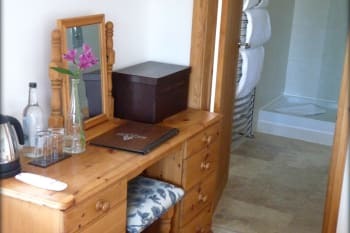 Beachcroft boutique b&b provides private luxurious accommodation within an informal, friendly and relaxed atmosphere – appealing to the discerning traveller looking for a luxury weekend or short break stay. Quality and high standards of customer service are clearly evident and the establishment carries a Five Star endorsment from the AA. Carbis Bay is situated adjacent to St.Ives on Cornwall’s South West coast with the area providing carefree days on golden beaches, fresh clean air, vast blue skies and a clear warm ocean. During the summer months it truly is a breathtaking scene with palm trees, golden sands and turquoise blue seas. There are no rooms available at Beachcroft for these dates. 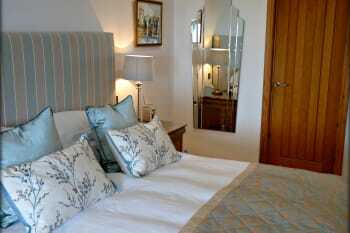 A cosy double room with a King size bed, chair, dresser and wardrobe. Large decked area with soft seating,sun loungers ,hammock,tables and chairs. Wifi access on decked area. Breakfast room with superb sea views.French doors leading to decked area. Great place to stay, everything excellent. Ask the owners for restaurant recommendations. The place was amazing so clean and fresh views were to die for . THe couple that run it we’re so pleasant couldn’t do enough to make ur stay so good . Breakfast was fantastic freshly cooked . Was very helpful to plan our day so we didn’t waste our day . Would definitely stay again did not want to leave . You need to visit st ives lovely village with pubs restaurants and quirky shops . My best was the minnick theatre the history behind it is intriguing so many more places to Cornwall is stunning. Very helpful and friendly. Lovely accommodation and catering. We are looking forward to visit Beachcroft again. La Casita is a very delicious restaurant only 10 minutes walk. Karen and David were welcoming and helpful. The breakfasts were delicious, with a range of fresh fruit and cooked choices. Part of the wonderful experience at Beachcroft was the great location, with the coastal path a great way to get into St Ives. 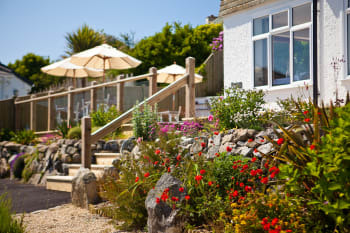 Carbis Bay is a perfect base to explore the Penwith peninsula and the Cornish countryside. A lovely place and a perfect location for St Ives / Carbis Bay area. The B&B is stylish and clean, the quality of the breakfast is in the range of a 5* hotel! Karen and David are greats hosts! Just ask Karen about good restaurants and places! Porthminster Beach Café (St. Ives) is breathtaking! Karen y David te reciben personalmente haciéndote sentir como en casa. Muy agradables. El desayuno exquisito con gran variedad de frutas frescas y preparadas con cariño. Todo el menage del hogar ( toallas, sábanas, cuberteria, vajilla...) de calidad y muy buen gusto. La habitación un poco pequeña pero con unas vistas preciosas y una cama muy cómoda. Al llegar nos dieron un mapa que nos fue muy útil. Aconsejo pasear por la zona, no dejar de recorrer los coast footpath. Un lugar muy recomendable. Great location with friendly hosts making helpful recommendations and overall a very nice stay. La Casita and Bean Inn were very good from local ones. Welcoming, superb hosts, choice of breakfast wide and varied, cooked to absolute perfection, cannot rate or recommend our stay high enough! Sea views are recommended, overlooking Carbis Bay is as good as any beach in the South of France. Finding the way down is a bit of a challenge but Karen will give instructions. A magical weekend that we will certainly repeat. Only there for two nights to relax and get away from the dreaded bike ride around Surrey that would have kept us prisoners for the weekend! The Alba cocktail bar may not be to everyone's taste but they mix a mean cocktail and the two chaps that run it are very pleasant, the Porthminster beach café for an evening meal, book early for a window seat, food is excellent as is the service. The captains table above the sloop inn is quaint and intimate, (mind your head though)! We used Ace and A1 taxi services to go into St. Ives, reliable, clean and modern cars, couldn't fault them. Not expensive either, cost between £5-£8 per trip, nice drivers, polite and professional. Wonderful and lovely place. We really enjoyed the time staying at the beachcroft! Excellent and delicous breakfast. Thank you very much for the perfect stay, the lovel breakfast and best restaurant recommendations. We will come back. 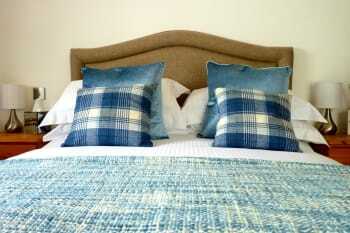 Super clean B&B, very comfy be, quited for a perfect sleep. The rooms are big, very nicely decorated, very good tea bags, nespresso coffee machine, lovely and very tasty breakfast, very good shouer and bath room. We stayed only 2 nights, wished to stay longer. It was a wonderful stay. Clean room, great breakfast, best view and a very nice and helpful lady who owns the beachcroft. Ask the owner and you get the best tips. Very good value for money! Walking distance to st Ives. ask Karen, she knows the best restaurants! Swimming, walking, restaurants excellent. Fresh knees and legs nessesary due to big different terrain levels. Karen and David are fantastic hosts. Nothing is too much trouble. So helpful. A great setting with unbelievable views. Ideal for walkers and for peace and quiet. We were made to feel very welcome,the room was outstanding and so was the breakfast. Hope to return one day,highly recommended. Thanks both for a great stay. Andrew and Helen. Thoroughly enjoyed my stay at Beachcroft. Due to a cancellation, thank you very much in accommodating myself at short notice. The rooms and breakfast were excellent. I would definitely recommend Porthgwidden Beach Cafe for both food and location. We thoroughly enjoyed our stay.The hotel was beautifully fitted out, the breakfasts perfectly cooked and piping hot. Our stay took place in very hot weather conditions and as a result the bedroom was extremely hot which made it difficult to sleep. A fan may be helpful for future guests. Karen and David are extremely friendly and welcoming. They go out of their way to help and make your stay more enjoyable. Breakfast was delicious. The room was very comfortable and pristine. We appreciated the fresh flowers in the bathroom as a nice personal touch. In fact Beachcroft is perfect. I would recommend the art courses at the St Ives school of Painting. We loved the Porthminster Beach Cafe. the landlord coupoe was very kind and helpful. Karen welcomed us each morning and offered an excellent freshly cooked breakfast which allowed some flexibility in choice. All areas were immaculately clean. The decor had been thoughtfully designed with an eclectic range of interesting paintings. We used the decking to chill out and enjoy the view over Carbis Bay. The bus service at the top of the road ran a frequent service to St Ives and as far as Truro and Penzance. These services continued into th late evening which was useful to travel back after eating in St Ives (saved hill climb). Also saved negotiating St Ives streets by car. Becks (just a short walk away) served excellent fish and chips Porthminster Beach Cafe was an excellent recommendation made by Karen. We were made to feel very welcome by our fantastic host. Lovely room, cracking views a splendid place to relax. Listen to your host for places to eat and drink. Cellar bistro was bang on. Avoid the Carbis Bay spa hotel if you are going there to eat it’s over priced bland flavourless tosh made to look good shame it didn’t taste like it looked. (Not on the list of places to eat that are recommended by the host) we wished we’d payed attention to that one. Beachcroft cracking we will be back. We warmest recomment this accommodation. The house is furnished lovely. Karen and Dave are very kind and you feal at home. Our score is six from five stars. The staff/owners are fantastic. They made every possible effort to make our stay as pleasant as possible. We highly recommend this B&B. Perfect support! No doubt, an excellent place for making holidays. Loved our stay at Beachcroft. The whole accommodation throughout is done to a very high standard, and the views are stunning. Delicious breakfasts, and friendly and welcoming hosts. I only wish we could have stayed longer, and we will definitely book to go back again. There are lovely coastal paths nearby, either along to St Ives or in the opposite direction towards Lelant. A walk to the Steeple is also well worth it - amazing views on a clear day. The Bean Inn is a vegetarian restaurant just a few minutes walk away - the food is delicious and a wide range of choice for veggies and vegans. Beachcroft is located at Carbis Bay which is truly idyllic and accommodation overlooks this fantastic bay. There is a coastal path that you could walk to take you directly into St Ives where you will experience wonderful hidden coves along the way and also can stop at Porthminster beach for a coffee or beer! There are some wonderful restaurants in St Ives to visit and our favourites are Porthgwidden Cafe, which overlooks a beautiful bay, the Firehouse serves great steak dishes and the Golden Cross pub in St Ives is good for lunch and a drink. Quaint little shops in St Ives is perfect for some retail therapy! We also visited St Michael's Mount where the beach and castle are fantastic. Some nice pubs there too and only 20 minutes drive away. This is a fantastic place in every way. Sharon and David went out of their way to make our stay exceptional in every way. Sharon's help and advice about the area was invaluable and David's cooked breakfasts were amazing. Sharon's recommendation to the Una Leisure centre and Gym was great with a fantastic swimming pool which was enjoyed by our family. Great hospitality, fabulous breakfast, very helpful hosts recommending brilliant day trips to explore Cornwall at its best. Everything was great!!! Ask Karen and David and everything is fine!!! This is the best accommodation we have stayed in this year. Absolutely spotless. Very relaxed atmosphere, staff always available. Everything you need for relaxing holiday. Varied choice of breakfast menu and very well cooked. Loved it. We will be back when we come back to Cornwall. Just a short car ride to St Ives, but you can catch the bus up the hill on the main road. Only 8 miles from St Micheal's Mount and car park. Very close to a large Tesco 's. Very welcoming and helpful regarding booking dinner tables and taxis. Also regarding the area it is. Very hilly and lots of people have dogs on leads so would not recommend Cornwall as an area for those who are not dog lovers. They are very helpful to our personal needs. Great stay. We would always come back! Karen and David are very friendly hosts. Beachcroft is finished to an extremely high standard (5 star), and is situated in a quiet location but within an easy walk to St.Ives centre. Breakfast is cooked fresh exactly as you want it, and is served in a very pleasant dining room with views across Carbis Bay. We will definitely return to this gem. Karen supplied us with a list of good restaurants, and was a font of knowledge about 'attractions' in Cornwall. Wonderful hosts: genuinely friendly. Stunning accommodation: intelligent attention to detail with all aspects of the rooms. Could easily be used as an example of best practice for Product Design students. One of the most impressive places we have ever stayed. Looked after by three very attentive people: we were seriously pampered. We chose to stay in Beechcroft to avoid the vehicle congestion of St Ives. To get into St Ives we walked down to Carbis Bay and along the coastal path. We returned by Taxi (£5.50) one day and bus another day. We were also able to walk the coastal path to Lelant and get the train back into St Ives. On our first night we managed to get a table in the vegetarian restaurant, just a short walk up Valley road to the main road: very enjoyable food and delightful service. Other main meals were taken in some of the many excellent restaurants in St Ives (Karen will give you all the advice you need on where to eat: and where to avoid). Wonderful stay in a beautiful setting. Karen was so welcoming. The bedrooms and standards of all rooms first class. My husband and I rarely holiday in the UK but the stay at Beachcroft has certainly changed our opinion and we will definitely be back next year. Excellent all around experience. Breakfast superb. Karen arranged our restaurants each night as well. She definitely goes the extra mile to ensure guests have a first class experience. The beaches are fantastic, restaurents to recommend Porthmeor Beach Café and Porthwidden Beach Café. We also had a fabulous meal at the Fire Grill steakhouse in St Ives on our last night which was excellent. Highly recommended, we had a lovely stay. David and Karen were very friendly and made us feel at home. The dining room looked out to sea and we could enjoy the view while eating a tasty breakfast. Will definitely come again! Fantastic rooms with beautiful location. Incredible view. Gorgeous breakfast. Everything about Beachcroft is 1st class,our stay was fantastic. warm welcome breakfast and staff all very Helpfull. We really enjoyed our stay at Beachcroft the hosts are very friendly and helpful.Will advise on best restaurants and events,even have speed dial to restaurants.Food is excellent as are the staff.Highly recommend Beachcroft. Having stayed at Beachcroft every year (sometimes more than once a year) since you opened, I think that speaks for itself! 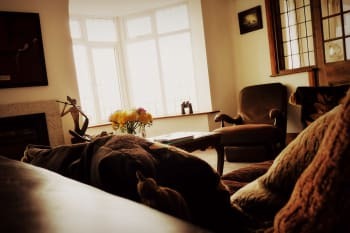 Always a warm welcome and nothing is too much trouble, a real home from home allowing us to relax the way we'd like to. Great restaurants in St Ives but book well in advance. Anything from burgers at Blas to fine dining at Porthminster Beach Cafe. Glorious coastal walks and scenery. National Trust gardens not far away. Don't miss The Minack Theatre - fantastic atmosphere. Art galleries everywhere you look, and not just Tate St Ives. Barbara Hepworth museum so unique. Great beaches, well maintained. Challenging golf at West Cornwall GC. There's so much to see and do! Fantastic place for a relaxing made to feel welcome as soon as we arrived Karen's the perfect host will definitely be going back. 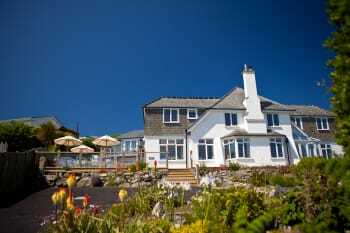 This is our second stay with Karen and David at there perfect retreat in quiet carbis bay . It's a boutique hotel with a team of great staff where nothing is too much trouble . It's a perfect distance away from St Ives to walk off breakfast which surpasses London hotels by a mile . The hotel is in a great position with views over Carbis Bay Hayle, and Quithian Sands. We will be back soon to chill out in such a wonderful place and wonderful people. Personally we don't plan what to eat or where to go as the weather denotes the order of the day . There are great places to eat whatever your budget . One of the best stays we have in England. This is a lovely Boutique B & B and I would be happy to recommend it to anyone wishing to visit the area. 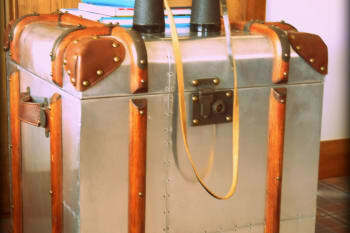 The rooms are extremely well equipped and the owners couldn't have made us more welcome. We absolutely enjoyed our stay and like to thank you for everything. Beautiful view on the sea Distance to st Ives a half an hour by feet. Great breakfast! Brilliant stay, enjoyed every minute. Everything was superb and spot-on! Von der Ankunft bis zur Abreise war alles perfekt. Auf unserer Reise durch Cornwall war Beachcroft mit Abstand das beste B&B. Karen gab uns ausgezeichnete Infos für die Tage in St Ives. Auf Grund Ihrer Empfehlung und Reservierung haben wir ausgezeichnet zu Abend gegessen - und das beste Frühstück - Handmade by David. Unbedingt St Michaels Mount und Bedruthan Steps anschauen. Excellent hosts Fabulous accommodation Scrumptious breakfasts Serene ambience Not ONE negative F A B U L O U S!!! Great view and excellent breakfast! HOTEL SHOULD BE 10 STARS. KAREN MADE US FEEL VERY WELCOME. FOOD WAS EXCELLENT CHOICE OF BREAKFAST AND BEVERAGES. KAREN IS VERY WELCOMING AND AN EXCELLENT HOST. ROOMS IN THE HOTEL ARE VERY VERY PLUSH.WHAT A LOVELY PLACE TO STAY. Overwhelmed by Karen and Davids hospitality. A fantastic holiday. It's a bit awkward without a car. Very welcoming and friendly nothing was to much trouble . Thank you for recommending good restaurants. The porthgwidden beach cafe in st Ives is well worth going to ,the food was great . The hosts are amazing, the rooms beautiful, the bathrooms great, the bed super comfortable and breakfast wonderful. Wish we could have stayed longer! Made to feel welcome as always, and nothing is too much trouble. Karen & David advise on eateries according to taste but ensure to book early to avoid disappointment, perhaps even days before you actually arrive at Beachcroft. If using the local bus service into St Ives, buy a return ticket (it's cheaper) but check the timetable. Or, cheaper still, if you're brave enough, drive in to town and park in one of the car parks! You'll never get tired of the scenery - the Cornish coastline is breathtaking - take your walking boots. We had a wonderful stay at Beachcroft. Karen and David made us feel very welcome and made our holiday very special. The property is beautiful and in a lovely location. Would highly recommend it. Would love to return next year. Karen kindly gave us a list of restaurants. We dined at the Porthminster Beach Cafe which was wonderful and The Cellar Bistro was lovely too. Absolute Cosy place. Warmhearted owners. Perfect Place for a stayover in St.Ives. Our room was impeccable. The public space was an excellent extension of our private quarters. We were treated with good natured care and respect. Unsolicited recommendations to improve our stay were right on target Karenelicited our interest in theatres music and spectacular terrain and obtained tough to get ticket reservations for a matinee performance of the Mikado at one of the most spectacular cliff side theatres in the world. Follow their recommendations. You won't go wrong. Our 4 nights were outstanding. the breakfasts were great. The rates were a bargain for the total experience. My wife and I travel extensively (over 40 countries) and prefer B&b an small hotels wherever possible. Beachfront is a winner. Karen & David made us thoroughly welcome and we loved the retreat. Attention to detail was excellent and superb breakfast. Great views from bedroom and quirky artwork within. Wonderful atmosphere and would recommend to friends/family. St Ives has wonderful art galleries/jewellery shops. Coastal walks were beautiful. We particularly liked walking from Carbis Bay to Lelant Saltings and picking up the train back to St Ives. Another coastal walk to and around Clodgy Point was also enjoyable. Porthkidney beaches and Carbis Bay were stunning. Excellent high end facilities. Very clean , attention to detail can't be faulted. Lovely hosts and yummy breakfast made with good quality produce. Easy access to st Ives . Would stay again without hesitation . Perfect in all respects. We would certainly return. The room was very comfortable - good quality linen, tea/coffee and top class breakfasts. We have had a fabulous stay at Beachcroft. The facilities were excellent, breakfast delicious and Karen was the most friendly and helpful hostess. We were lucky as the sun shone on us which made the trip complete. Thank you to the team at Beachcroft. We hope to return one day. Mermaid restaurant was very good. Walk into St Ives on coast path good but many steps so only use if good mobility. Wouldn't recommend at night as no lights. Beachcroft is just brilliant! 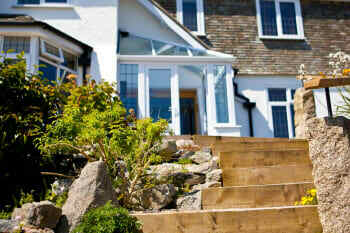 The B&B is situated in a wonderful house that fits 100% into its surroundings, offering a perfect view of Carbis Bay. The lovely hosts have a great sense for detail regarding the furnishing and decoration which makes you really feel at home. Breakfast is also just what you can dream of: freshly cooked with local and healthy ingredients. Friendly and professionally run family business. Attention to detail and very elegant. Will definitely go back as the location is perfect. 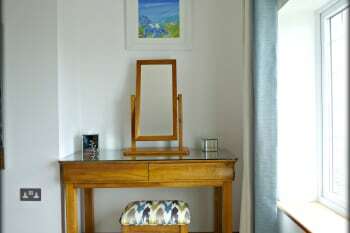 Comfortable room, gracious attentive service, and good location to walk into St. Ives. Karen has a wealth of information and kindly gave us a list of "what not to miss" on our first trip to Cornwall. Breakfast was wonderful and cooked to order. Will certainly stay here again on our next time through. Follow Karen's advice of the places to see and take a day trip around Cornwall. The best accomodation and Landlords we have been to. We very made to feel very welcome and everything was spot on. Very friendly owners, they helped us with recommendations for sightseeing and restaurants. The room was clean and the hotel had a great view over the bay. Very good breakfast with a lot of fruits. Porthminster beach cafe had excellent food. Warm and friendly greeting with lots of local information. The thoughtful decor and furnishings added to the enjoyment of our stay. What a treat to have such a choice for breakfast. We particularly appreciated the fresh fruit and the freshly cooked breakfast. The bedroom and bathroom were each very spacious and provided everything we needed. We were lucky to have good weather but it was good to know that there was a friendly lounge to use if we had to curl up with our books because of rain. We visited one of our favourite cafes, Porthgwidden Beach Cafe. Set on the beach, the location is lovely and the menu is imaginative. Staff very friendly and helpful,the room and bathroom were beautiful and spotless. Plenty of places to eat ,and visit. Fantastic to meet you both, a wonderful place to stay. Easy access to Carbis Bay beach and the train journey in and out of St. Ives. Halestown Inn is a great place to eat. Everything was perfect , Karen & David are wonderful hosts . 5 stars all the way ! Karen is a wonderful host. She made us feel at home and somehow managed to get us reservations every night at the best restaurants in St Ives. Ask Karen. In Karen we trust ! Karen and her staff were fantastic , very good area , great location in lovely house . All good A+. Great Beaches , walks , stunning views ,close to National Trust sites in the area and good places to eat in and around St Ives . so many restaurants around some of them you need to book,if you are not sure of places to visit speak to karen she will up date you of places that you will enjoy visiting. We were made so welcome in this beautiful house. The breakfasts were very good and all cooked to order. Beachcroft is in a lovely location, overlooking Carbis Bay and we could see the sun rise from our bed! The house is spotlessly clean, very well decorated with some exceptional art. Karen and David are perfect hosts, providing advice, suggestions and a map, and even bottles of water for our journey home. 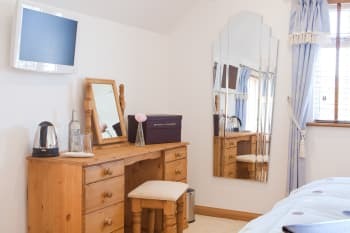 Beachcroft is ideally suited for a holiday in this area, being about 20-25 minutes walk along the coast path to St. Ives, where there are many good restaurants and bars. There are lots of gardens to visit in the area and the Barbara Hepworth museum and garden is a must. We loved the Minack Theatre and St. Michael's Mount, both a short drive away. A lovely place to stay could not fault anything and would say a warm welcome awaits you. We would say to eat at The Black Rock, The fire House and The tea room all different but all worth a visit. Everything about our hosts and the facilities was top quality. In our own case, they went far beyond the normal 'service' to help us overcome car problems. Help when it was needed, never any intrusion. Parking in St Ives is awfully restricted. There is a good bus service just up the road from Beachcroft right into the town - and return! Extremely nice and cosy little hotel at a perfect location with only 4 rooms. The owner and host is extremely friendly and supportive. The room was outstanding and the breakfast with view of St. Ives beach was unbeatable. 5* superior!!! Just ask the host Karen for recommendations. She is extremely helpful and knows the perfect locations. Scenic walk to St Ives on a footpath through quiet residential area, lots of flowers and green along the way. 5star accommodation, 1st class breakfast all freshly cooked to order and plenty of selection. 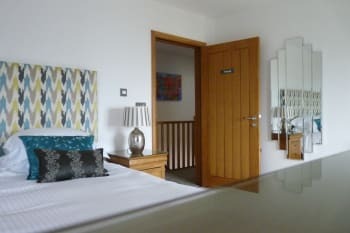 Karen was a superb host, very welcoming, nothing was too much trouble and very informative about the area .I would recommend the Beachcroft , to anyone who wants a lovely enjoyable stay in ST IVES and ihope to stay again later this year. ask Karen, she can tell you anything about places to eat and things to do, she is an encyclopedia of informative information. If you want to relax and enjoy luxury then book to stay at beachcroft. It really is a beautiful place to stay. Karen has thought of everything!!! You will be looked after very well! Go to Philps in Hayle for your pasties. Have a look at the giant ones they make, they are huge. Pizza Express in St Ives town is another good place to eat, but would suggest booking in high season. Go to S H Ferrell & Son in Fore St St Ives for saffron buns/ chelsea cake. This has got to be the oldest original bakery in St Ives - this is a best kept secret, but worth sharing !!! We've stayed in a lot of places and the Beachcroft is probably the best of its kind. Karen and the other staff were very friendly and informative regarding the local area. The accommodation and decor was top notch and spotlessly clean. The breakfast was also of the highest quality. We would highly recommend the Beachcroft to anyone visiting the area. If you decide to walk the main road, do it going to St Ives and get a bus / taxi back as it's downhill going there. Take a look down the back streets too as there are lots of interesting little shops. Some great views from the top of The Island. Absolutely charming...didn't want to leave! Karen and Sarah are just delightful and so helpful...they can't do enough for you. Take the coastal road from St. Ives to Lands End...it is stunning scenery. Kynance cove and Lizard are absolute must do's. There is so much to see with the beautiful beaches, St Ives just a short walk along the beautiful cliff path. The Minack Theatre is an absolute must see. We really enjoyed our stay at Beachcroft. Everything was very clean, rooms well equipped, and little extras included (e.g. bottled water etc.) 'Breakfast room' lovely, clean and spacious and breakfast very good. Karen also provided lots of information about local sites/restaurants etc. We would not hesitate to recommend/book again with Beachcroft. Parking is quite limited in St. Ives. Visitors will often 'park & ride' or take taxis. There is a stunning drive along the B3306 road towards Penzance etc. not to be missed. Trebah Gardens lovely, along with all the beaches. Would definitely recommend the Cellar Bistro restaurant. We wouldn't stay anywhere else. Exceptionally high standard, owners are very welcoming and kind and informative. Breakfast of high quality and cooked with perfection. Cider farm is very interesting. Carbis bay is a peaceful beach. Lovely place ! Nice clean rooms, wonderful sea-view. Breakfast was fresh and very good. Enough parkingplace and close to the hotel. The breakfast was superb , I only regret is that Karen wasn't serving evening meal because we both feel , her cooking was brill and we sure the dinner would have been excellent . We both enjoyed our stay and would love to return next year . Karen and the staff were very friendly and helpful. Use the coastal path for an easy 20 minute walk into St. Ives. enjoyed the pub food at the "Union" with no need to book. We had a wonderful stay at Beachcroft for our mini-moon. The rooms are beautifully presented with gorgeous views across the bay and Karen was a really thoughtful, friendly and unobtrusive host. The house is bright and spotless with gorgeous contemporary artworks and lovely homely touches. The first class breakfast was well worth getting out of the comfy beds for. Can't recommend Beachcroft highly enough. Karen recommended some great local restaurants so we had delicious meals out. We also found the maps and walking guides fantastic - we enjoyed 2 stunning coastal walks. Nice and quiet place with really welcoming hosts. Clean beaches with good beach-Cafés. But beware of embarrassing seagulls! Lively St. Ives closeby. Thank you so much a fantastic B and B. Karen was so friendly and helpful with information about the local area. The room was lovely, we liked the little details such as nice toilettes in the bathroom, cafetiere instead of instead coffee. Excellent breakfast freshly cooked to order by Karen. Really enjoyed our time in Carbis bay. Lovely walk along the coastal path to St Ives. 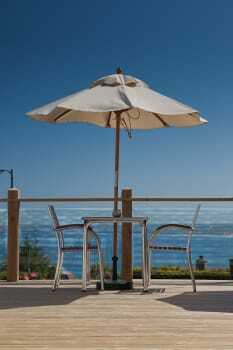 Beach bar is great for a glass of wine or a beer after walking back from St Ives. Very welcoming and friendly host,nothing was to much trouble would definitely stay again. St Ives is not easy to park the car but spaces can sometimes be found at The Sloop but more likely on Smeatons Pier. Otherwise it's park and ride from the Leisure Centre. Buses are regular but it's not far to walk. Book restaurants well in advance, ask Karen and David for recommendations. South West coast walks are a must for dramatic scenery and wildlife. RSPB at Hayle. Lovely clean beaches. Mining industry locations to visit, some National Trust. Loads of gardens to visit in Penwith, also some National Trust. Book to see a play at the Minack - take a cushion and a blanket! Lots of art galleries to browse around including Tate St Ives, Barbara Hepworth house and garden, Leach Pottery. Golf at Lelant is a challenge! See the seals at Godrevy. I could go on, there's so much to see and do! Second time we have stayed here and will go back again,highly reccommended. Karen the owner and the rest of the staff are first class,very helpfull and accommodating. 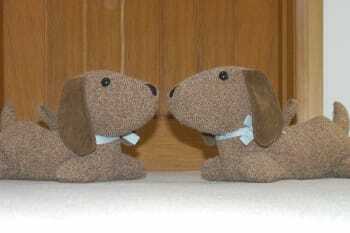 Myself and my husband had a wonderful stay at Beachcroft, it was our honeymoon and we couldn't of asked for anymore. The room was wonderful, very comfy bed, huge shower and bathroom, the view from our window was absolutely stunning, we could comfortably sit in bed and look out to sea. Our breakfast was so delicious, we couldn't wait to get down in the morning! The effort the staff put in at Beachcroft was wonderful, we had a lovely bottle of Prosecco waiting for us in our room to celebrate our honeymoon! We will definitely want to come back again!! Amazing place to stay! We ate out the both nights we stayed, our first meal out was at Porthgwidden cafe and restaurant, a lovely little restaurant right on the beach! They served wonderful food. The second we ate at Cellar Bistro, gorgeous food and wine! A real treat! There is a local train that runs very regular, it can take you into St.Ives and Penzance, myself and my husband took the coastal path walk into St.Ives, it took us about 30/40 mins but it was a beautiful walk and the town is wonderful, lots of shops, lots of art galleries, a beautiful beach. We spent most of our afternoon on the Carbis Bay beach, glorious soft white sand and crystal blue sea, absolutely stunning! Yummy ice cream too! MOST helpful with suggestions as well as actual help such as maps, getting taxis, directions. Breakfasts very good, plentiful and tasty. We were made to feel comfortable during our stay. Beautiful home with well-designed, modern furnishings, quiet rooms, nice library and lounge for guests. Too many excellent restaurants to list. See the suggestions on Beachcroft website. You can't go wrong. Our favorite was Porthminster Cafe in St. Ives. Fantastic views of Carbis bay with excellent room and guest house facilities. Owners could not have been more helpful really enjoyed our stay. Visit kynance cove (50mins travel by car) sensational NT property. We felt very welcome and had a wonderful stay. There's so much to do the area is unbelievable You have to see for yourself Myself and my wife loved every minute and we will be back at the beach croft next year. Karen went the extra mile at all times ensuring our stay was comfortable. Prior to arrival she made two restaurant reservations for us, so we could decide which one to go to, there was no pressure to go to either one. We did decide to take on her recommendation and both were brilliant and within a good price range. The acomodation was very clean and has a contemporary decoration. Everthing was in good working order and it felt like we had the place to ourselves. We had a large sea facing double room, the views are excellent and the rooms large and comfortable. There is even a well maintained garden/terrace area, with loungers if you are lucky enough to get some sunshine when you visit. There is the option of a healthy or a cooked breakfast, over the weekend we tried a few things and the food was delicious and well presented.I can't fault the accomodation or the service we received. I would come back again, and will recommend to our friends. The only suggestion I would make is to have a mini fridge in the room, however saying that I am sure if we asked Karen to use the kitchen fridge it would have been fine. Ladies make sure you take a pair of flat shoes, as there are quite a few hills. One of St Ives finest.A real gem for anyone looking for a base and wanting top quality accommodation,location and service. Probably the Best! What a welcome, nothing was too much trouble. I got a call from the owner around midday of my trip suggesting that as it was bank holiday weekend that she reserves us a table for dinner that evening as they do not do evening meals. When we arrived Angela spent time recommending and booking various restaurants for our weekend and her recommendations did not disappoint. 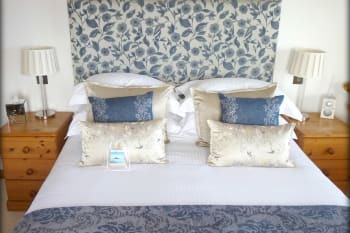 The rooms were immaculate and spacious, the decor was stunning and the breakfast was superbly cooked with tip top service. Beachcroft is superbly placed for footpaths in to St.Ives, or along the coast of Cornwall. We shall definitely be returning! THANK YOU so much!!! 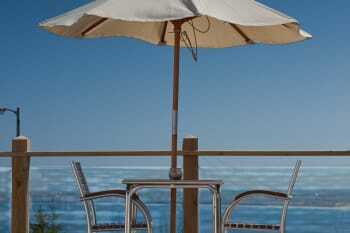 Porthminster Beach Cafe - great beachside restaurant of superb quality food and great views. Tip - try to book at a time when you can watch the sunset. Cellar Bistro St Ives - open evenings only, but great food and the staff are so lovely and friendly, nothing is to much trouble and for those who love there food, this again will not disappoint. Karen & Dave are perfect hosts. The facilities are well equipped and spotlessly clean. The breakfasts are to die for. Nothing is too much trouble. If I was to sum this venue up in one word it would be'class'. The eating houses in St Ives are all pretty good, however, you will need to book most of them to guarantee a seat. Walking the coastal paths is great fun if you are able bodied, however, the main road into St.Ives is a lot easier on the old legs if you are not so agile. Perfection! Absolutely wonderful experience - superlative in every respect. This is a fabulous B&B which provides solace for the soul! Tasteful and elegant decor throughout with an attention to detail and comfort that surpasses all expectation. We stayed in Trevose Room which had the most breathtaking views over Carbis Bay and beyond, a bathroom which was simply divine including the Molten Brown toiletries! Breakfast was delicious and the array of fresh fruit in particular, was lovely. Our hosts could not have been more attentive, welcoming and informative about beautiful St Ives and other resorts / places of interest in Cornwall. Utter bliss from beginning to end of our thee day stay and we left feeling rested, relaxed and rejuvenated. We are already planning our next visit! To sum it up in one word - PERFECTION. Thank you! This is an opportunity not to be missed! If you are looking for luxury, Beachcroft provides this and more in abundance. Hotel and owners fantastic, could not fault a thing. Room and bed were absolutely first class as was the rest of the Hotel inside and out and is designed to a very high standard. Breakfast was superb. The view from our window was top class and we would recommend the Hotel to anyone. St.Ives centre is only 1 mile away and an easy walk down. Busses are frequent with stops at top of road. The Watermill Pub a few miles away does very good food and is worth a visit. The location is perfect, great views, no noise, close to the beach (although its a bit of a steep hill on the way back which may be challenging for older people). The room was a good size and exceptionally clean. Lovely body wash for use. A fridge in the room would have been useful but certainly not essential. Great Pasties at the St Ives bakery on Fore st in St Ives. Don't walk around while eating a pasty though as the sea gulls are vicious. The walk into St Ives along the coastal trail is easy and there is no need for boots as its all tar.